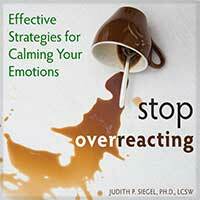 Today we sharing an excerpt from the audiobook Stop Overreacting: Effective Strategies for Calming Your Emotions written by marriage and family therapist Judith Siegel. Stop Overreacting helps you identify your emotional triggers and discover a new way of processing impulsive thoughts and feelings. You’ll learn how your emotions can undermine your ability to think rationally in times of crisis and stress. You’ll also learn how to neutralize overwhelming emotions and choose healthy responses instead of losing control. In this episode, Judith Siegel offers a series of questions that will help you gain a better perspective and learn how to handle rejection. She also offers two exercises to help you learn more about the experience, and what you really want in life. Any rejection will create a sense of discomfort and pain, but that can be a momentary response. The amygdala can make us experience emotional intensity that may be greater than the situation calls for. As we begin to connect our thoughts and feelings, the pain will subside.